It's been one year since Dunedin became a refugee resettlement location. Red Cross communications advisor, Gemma Snowdon, went and met one of the families who arrived last April to see how they've adjusted to life as new Kiwis. A small face peers out at us from the white wooden house in Dunedin's east. The front door is flung open as we approach and what sounds like a stampede of children can be heard toward the rear of the property. It's been a year since the Haroura's arrived in Dunedin and Red Cross resettlement case worker, Rula Talahma, and I have come to see how they're getting on. We walk into the living room to find their Red Cross volunteer, Steve Walker, being mobbed by 6-year-old Rahaf and her 4-year-old sister Lina. They spy us and Rahaf starts dancing around the room, showing off her candle, and trying to draw the attention to herself. The child standing in the centre of the room is completely different to the one who disembarked the flight this time last year. “She was the shyest person I'd ever met when she moved here and now she's one of the most confident,” says Steve. The Haroura's arrival in Dunedin ended years of instability following the outbreak of war in Syria in 2011. Mohamad and Nawal took their four children and fled their village near Damascus in 2013 in search of safety. They spent the following three years in Lebanon where they registered as refugees and awaited resettlement. Finally, they were told that New Zealand, a country they knew nothing about, would accept them. “We knew that it was very far away but not much else,” laughs Mohamad. 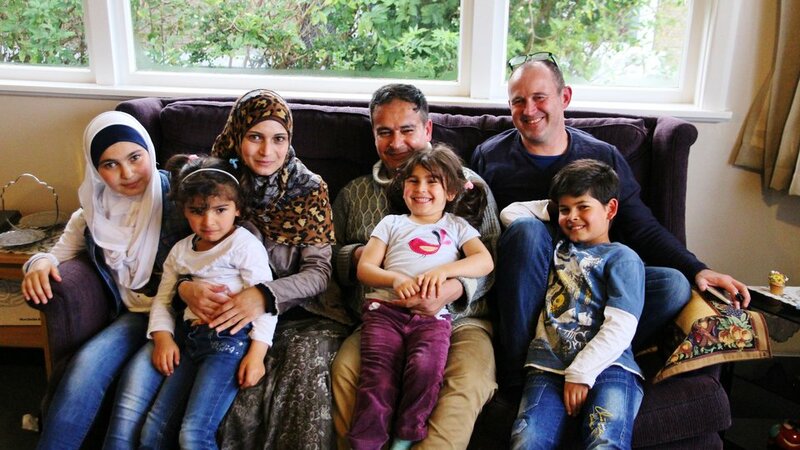 When the plane carrying the Haroura's and 12 other Syrian families touched down, they became the first people to be resettled in Dunedin as part of the refugee quota programme, making the southern city New Zealand’s sixth resettlement location. Emotions were high in the airport as the families disembarked with more than a few tears shed by Red Cross staff and volunteers and the families themselves. “It was amazing for us to see all the people [who showed up to the airport to greet them] standing in front of us,” says Nawal. “We won't ever forget that day,” Mohamad agrees. “I was a bit nervous because we’d been building up to the arrival for so long,” reflects Steve. It isn’t only the 13 families who have come a long way since last April; Dunedin has since welcomed more than 220 Syrian and Palestinian people under the refugee quota programme. “Dunedin has reacted in an extremely positive way; people have seen [becoming a resettlement location] as a point of interest and as an opportunity to have an increasingly diverse community,” says Red Cross Southern Humanitarian Services manager, Sue Price. New Zealand Red Cross provides a pathways to resettlement programme to all new arrivals. Through this programme, families are provided with practical day-to-day support and long-term planning for their lives in New Zealand. In most cases, the families are part of the programme for a year before graduating, something the Haroura's are about to do. Though Red Cross will still be there to support the family if they need it, the Haroura's have become Dunedin locals and no longer need the support they once did. This is most evident in the progress of the family’s language skills. Ousama chants “English, English, English” when I ask Mohammad and Nawal if they'd prefer to do the interview in Arabic or English. They both laugh and oblige. I brought Rula along to provide language support but she rarely has to chime in as Mohamad and Nawal tell their stories. The language skills of their children are impressive too; the four of them switch easily between Arabic and English, with Rahaf even showing us that she can count in Te Reo, something she's picked up from school. “They are very quick,” says Nawal about their schooling. The family have been making the most of their first summer in Dunedin with beach visits. They laugh as they recall their first trip to the waterfront and how the kids were so overcome with excitement that they jumped into the water fully clothed. “I didn’t have any change of clothes with me and it was very cold for them. It was crazy,” says Nawal. Steve has been a big part of the Haroura’s resettlement process too, quickly becoming an important friend to the family. He's introduced them to life in New Zealand and, though the volunteer placement has officially ended, Steve still regularly drops by for social visit and often stays for dinner. With Dunedin fully established as a refugee resettlement location, the Haroura’s and Red Cross are looking forward to what the future will bring. Sue Price is excited to see how the city’s new residents make their way and become an important part of the fabric of Dunedin. Mohamad and Nawal are studying at the Polytech, finishing their English courses and looking forward to graduating. Mohamad took some seasonal work over the summer and wants to secure something more permanent soon. “We’re looking forward to learning more English,” says Nawal. Wafaa and Ousama are ambitious and diligent when it comes to their schooling with plans to become doctors when they grow up. “I want to help other people,” says Wafaa of her decision. At four years old, little Lina hasn’t quite settled on what she wants to do after school but often copies her older sibling, proclaiming her plans to be a doctor. And 6-year-old Rahaf? Well, she says she doesn’t want to grow up. If you'd like to help support refugee resettlement in New Zealand you can find out about applying to be a refugee support volunteer here. You can also join this years fundraiser, Red Cross Journey, to support programmes like our refugee resettlement ones. Gemma is the Communications Advisor for Refugee Programmes, based at National Office. When she is not out collecting good stories, you'll find her running or reading.